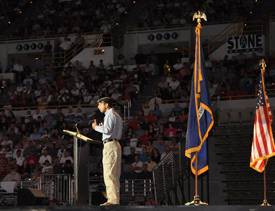 STAR SEARCH: Several people said, and I’d have to agree, that while Bobby Jindal’s speech was quite well-received by the crowd at the rally what was perhaps more interesting was the idea that a large piece of Louisiana’s political future was on hand at that rally. Lieutenant Governor Scott Angelle, who was appointed to his position after a long stint as Louisiana’s Department of Natural Resources head and whose reputation has been as something of a bureaucrat, gave a stem-winding address which had the joint jumping right from the beginning. Angelle, who served as the master of ceremonies for the rally, landed a direct hit on the Obama administration for its seeming dependence on energy from “the birds and the bees and the flowers and the trees” – an indication that he might not remain a Democrat for too much longer if he does want to embark on a political career beyond his current temporary job. Angelle wasn’t alone as a rising star. Plaquemines Parish President Billy Nungesser was also on hand, and while Nungesser’s speech didn’t rise to the level of intensity some of his cable news appearances have he did quite well. Nungesser also pulled no punches in criticizing the Obama administration. His money line of “and we can’t afford to be crippled again because of you” brought the house down and serves as a signature Nungesser quote along with the many others he’s had. But Lafourche Parish President Charlotte Randolph burst on the scene yesterday as well. Randolph had been considered a minor player in the Gulf Oil Spill saga – she’d been in the papers, certainly, but not with the profile of a Nungesser or Jindal. But with yesterday’s speech, in which she revealed that the National Association of Counties had passed a resolution calling on Obama to lift the moratorium, related that she told the president “you’re not in touch with real America” and suggested that if safety and the inadequate resources to handle a second spill are the reason for the moratorium then perhaps Louisiana should stop the importation of foreign oil through the Louisiana Offshore Oil Port since over 11,000 tankers traverse the Gulf each year, each carrying an equivalent amount of oil to that spilled by the Macondo well, Randolph is now on her way to being a statewide name. She may have a decision or two to make in advance of next year’s statewide cycle, just as Nungesser and Angelle do. COUNTER-PROTESTS: Outside of the Cajundome, a pretty typical scenario played out – an insignificant group of misfits and kooks staggered around with signs in favor of the moratorium, only to be heckled by attendees at the event and mobbed by reporters. Maybe a couple of dozen counter-protestors, most of whom seemed to be of the opinion that the 11,000 or so on hand protesting the moratorium were only doing so because Obama is black – while nearly that many reporters were on hand to cover the gaggle. OBAMAMEISTER FALLS SHORT: If there was a disappointment among the speeches, it was former Shell CEO John Hofmeister, perhaps the biggest name among the speakers at the rally. Hofmeister’s speech was a relatively powerful one and it took some very hard shots at the president and his moratorium. But whoever wrote the speech for Hofmeister, if he didn’t write it himself, did him no favors. The former oil company executive, who now heads a group called Citizens for Affordable Energy, opened his time by stating that he voted for Obama. That drew a lusty chorus of boos from the gathering, and it seemed to overshadow everything else Hofmeister said – even though there was a lot to like about what followed. Hofmeister referenced the stupid “boot on the neck” statements of several members of the Obama administration and drew applause when he said “I never expected your boot on the necks of Louisianians.” But what could have been a stirring address and a call to action to join his group – Hofmeister did solicit donations to CAE from a hall full of people terrified of losing their jobs, which was also a bit off-putting – seemed to fall flat. Maybe if the former Shell CEO had just said “Mr. President, your election was met with a great deal of optimism. I shared that optimism. And now I share the disappointment of millions at the poor decisions you have made,” he would have drawn the crowd in. It’s not that Hofmeister’s speech was a bad one. There were no bad speeches yesterday. But he could have had the best, given his stature and his big-picture message of American energy independence, and he didn’t. A LONG 93 SECONDS: As the event got started, the crowd observed 93 seconds of silence for the memory of the 11 men who died aboard the Deepwater Horizon 93 days earlier. You don’t really get a feel for how long 93 seconds can be until you sit through an experience like that. It got a little emotional in that room. SUCKTASTIC REPORTING: The AP’s Mary Foster used to cover LSU sports, and folks tended to complain about the lack of detail and perspective in her reporting. Now she’s covering general news, and not much has changed. Despite the rhetoric, industry experts say a feared exodus of deepwater rigs from the Gulf hasn’t yet materialized, and that the business would quickly rebound once the ban expires. Houston-based Diamond Offshore Drilling Inc., the second-largest U.S. contractor, has said it’s moving two of its Gulf rigs to Egypt and the Republic of Congo, and Scotland’s Stena Drilling Ltd., is shifting one to Canada, but 31 remain in place. The three departures are below the eight that had indicated they were ready to move, said Jim Richardson, economics professor and director of the Public Administration Institute at Louisiana State University. “It was my understanding that initially there were a number of them that were going to pick up much more quickly,” he said. Argus Research analyst Phil Weiss said the sooner the moratorium is lifted, the more likely the rigs will stay. “They’re looking for work, and wherever it is, that’s where they’re going to go. But it’s not so simple moving a rig. It takes a lot of time and money. And after you’ve taken the time and the money, you’re going to want it to stay for a while,” he said. Besides renegotiating contracts, some oil companies are seeking to void long-term deals with rig contractors, citing the drilling ban as an unforeseen catastrophe. Those rigs will remain in place until these disputes are resolved, said Rice University economist Kenneth Medlock III. “Nobody should have expected the rigs to leave immediately,” he said. To call this slanted, or at least incomplete, journalism would be charitable. As Lafourche Parish President Charlotte Randolph mentioned in her speech, which Foster did not quote, by the middle of August those rig operators will be out of time and decisions will have to be made – and in lots of cases the decision will be to leave the Gulf in search of other opportunities. Foster acts like the loss of four rigs already isn’t a disaster for Louisiana – each rig affects some 1,500 jobs, so the loss of four of them already means 6,000 Louisiana jobs vaporized. And as Randolph also mentioned, no business can survive a six-month suspension. The rigs are only a small part of the equation. The marine service companies, the caterers, the industrial pipe manufacturers, the marine fabricators and all the countless other businesses which service an exploration rig will have nothing to do for the duration of the moratorium regardless of whether the rig owners manage to stick it out. And once those companies go out of business, they’re not coming back. It’s a terrible article, and the Times-Picayune’s readers are very poorly served for the paper having run it.